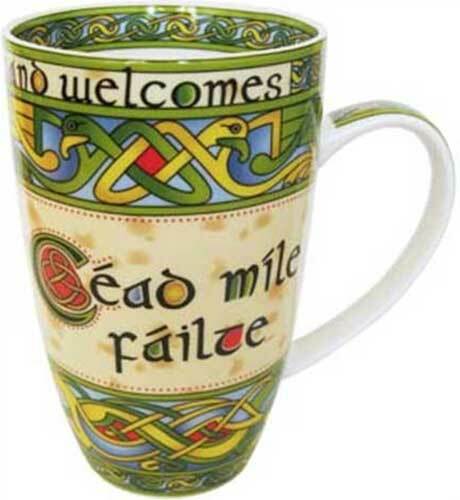 The céad mile fáilte Irish coffee mug is enhanced with a Celtic knot motif. This bone china Irish coffee mug, featuring céad mile fáilte is designed in the style of 9th century ancient Celtic manuscripts which would have been painted by monks onto vellum or calf skin. The Irish welcome, céad mile fáilte, means one hundred thousand welcome in Gaelic. This Irish coffee mug features a double sided design that features céad mile fáilte along with a colorful Celtic motif that is repeated along the inside rim. 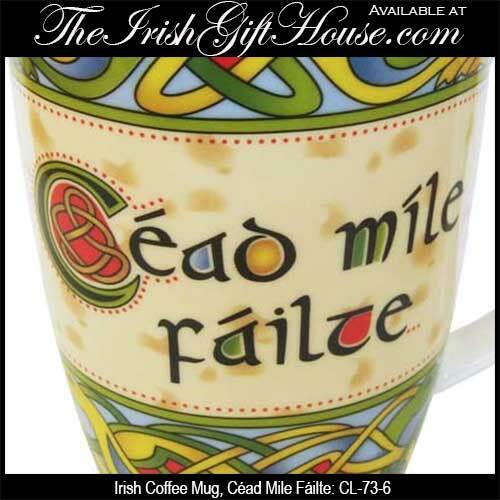 The céad mile fáilte coffee mug holds 14 ounces of your favorite beverage and it stands 5" tall. The Irish welcome coffee cup is made of bone china and it is dishwasher and microwave oven safe. The céad mile fáilte coffee cup is made in Ireland by Clara and it is gift boxed with a Celtic knot history cards that is complements of The Irish Gift House.